Two Years On ... from knee replacements. National Championship Series in Newfoundland, N.J.
Nearly two years ago I had my knees replaced with prosthetic knee joints. Since that time I have embarked on a bicycling challenge to push them as far as I can, to see how they hold up doing an above average amount of cycling. The cycling element is easy, it’s what I do. Pushing the limits is not so simple. In the long term I have set lofty goals. Climbing Mt. Washington in New Hampshire has long been on my bucket list, and I have scheduled the climb this year. The next long term goal will be to cross the United States in 2016 in 15 days … setting a record for crossing with two prosthetic knee joints. As for my short term goals, which are basically training for the long term, they include a regular schedule of rides over 100 miles, many of which include a fair amount of climbing. Distance is not as taxing on the knee joints on a bicycle, but climbing is another story. Climbing puts a lot of stress on the joint, especially when climbing out of the saddle. It is in the climbing where I notice my knees “talking to me” the most. They have not let me down. They always pull through … here I will outline what I have done so far to maintain my training schedule, working towards my long term goals. As I’ve stated previously, my training began the day after my knees were replaced. It did not take long to get back to cycling on the road. About 8 weeks and I was doing short rides on flat roads comfortably. From the beginning the aches I had were more related to muscle and tissue rather than the prosthesis themselves. For over a year I took it easy, logging regular rides while slowly adding distance and grade challenges. If my legs “spoke to me”, I listened. The most important thing I could do was to pay attention to what my knees were telling me. If I woke up and was feeling aching or pain, I’d take a day or two off. As time went on I felt more comfortable putting more stress on my knees. One year out from my surgery I was doing 20 – 40 mile rides comfortably and weekly mileage was over 100 miles per week. 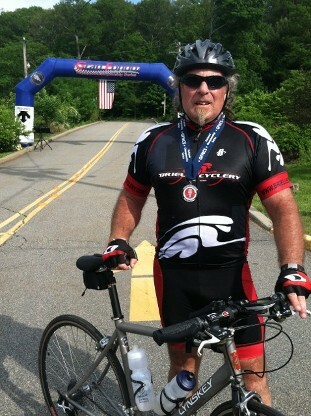 Thirteen months after my joint replacement I rode over 200 miles in one week. A great accomplishment considering a year earlier I could barely walk. I completed close to 5,000 miles in all of 2013 with very little resistance from the knee replacements I had received. In October of 2013 I began to engage in what I call “ride events”. These are organized rides of 100 miles or more, although some rides advertise as 100 may actually be just under the advertised mileage. Nevertheless they typically are challenging rides based on climbing and distance. The Bicycling Magazine Fall Classic was just such a ride. It was advertised as a “century” (100 mile ride), but in the end I only registered 88 miles on my computer. It did however boast 6,863’ of elevation gain, which was to be my biggest challenge in climbing to date. In the end I completed the ride and only felt minor discomfort the next day in my knees. Beyond that I felt great. I soon took on the RUSA (Randoneurs USA) R-12 challenge. The R-12 entails doing at least one 200k (124 miles) per month, in a twelve consecutive month period. I also embarked in the UMCA (Ultra Marathon Cycling Association) Year Rounder challenge. The Year Rounder involves doing twelve rides of 90 miles or more in a ten consecutive month period. Together, I reasoned they to be great motivators to keep my legs rolling over the pedals. By the end of 2013 I completed two 200k RUSA “brevet” rides, both of which count toward the respective challenge awards. I am on track for both awards thus far in 2014. I have completed at least one 200k per month, several with a good bit of climbing, and during a brutal winter. I have currently added 100k (62 miles) rides to my regular training, adding one or two100k rides per week to further push the limits of my knees. In June 2014 I completed the Highlands Gran Fondo National Championship Series ride, consisting of 98 miles with 9,558’ of elevation gain. The next day I was feeling no adverse effects from the ride in my knees. Up to that point it had been the most climbing I had done since my knee replacements. Between July 2013 thru July 2014 I rode more than 7,000 miles and climbed over 300,000 feet. In the end I believe my cycling success has come from being careful not to over-do my training, while at the same time push the limits of my prosthetics in a calculated manner. During training periods I take the time to let my body recover, I remind myself to ride within myself and to not try and keep up with the other riders I might find around me. There is always that group that feels that speed is utmost important, and they’re out there to prove they have the stuff to make the “Tour De France” team. I let them go. The ride is what is important to me. Finishing the ride is what’s most important. The ones hammering in the first 25 miles of a ride may only be doing the 60 mile loop … I choose to ride the 100 mile loop. I don’t know about the other riders blasting away up the road. Why am I there? “To complete the ride.” I won’t let others push me over the edge. I don’t climb with anyone but myself. I know I can make it over the climb, it just takes me longer to get to the top. Hey, I get more for my money by spending more time out on the road than everyone else … and, I finish. As of this point I can report that my prosthetic knee joints do remarkably well under the stress of cycling, in what would be considered an above average training program. In 2014 I am on track to accumulate over 6,000 miles, in a year when the winter weather kept many year round riders off the roads the first two months of the year. After two years of consistently putting them through the rigors, my prosthetic knees show no signs of holding me back from reaching my goals. Very promising to anyone on the fence as to whether they want to go through with the procedure of knee replacement. I say get off the fence and get up on a new set of knees. It will get you back to the things you haven’t been able to do comfortably in a long while … enjoy an active lifestyle.